£50 OFF BROCHURE PRICE!! - NOW JUST £185 PER PERSON. Famous for its long sandy beaches, level promenade and colourful pier, Paignton lies on England’s beautiful English Riviera on Devon’s southern coast. After the arrival of the railway this fishing village was transformed and became a favourite retreat for the Victorians. The long and flat seafront esplanade offers lovely views across Torbay with leisure facilities for the visitor. The town has some lovely public gardens and good shopping with an abundance of cafes and restaurants. With your free time you may like to visit the excellent Paignton Zoo on the outskirts of town or catch a bus along the coast road to the neighbouring towns of Torquay or Brixham. For those who like to explore, Paignton lies on the fantastic South West Coast Path with a chance to enjoy a coastal stroll and catch a bus back to the comfort of the hotel! Plenty of lovely excursion destinations in the area. After being collected from your local pick up point around 8.30/9.30am we have a comfort stop on route and a break for lunch before arriving at the hotel mid afternoon. In the morning we shall head off for a visit to the lovely Market town of Totnes. It’s a great town to explore with a bustling atmosphere and an array of interesting independent shops to explore. On our return we shall have a stop at the tranquil Buckfast Abbey - lovely spot for a cup of tea. Today we have an excursion to Dartmouth. Discover wonderful countryside before we arrive in this beautiful historic town. So much to see here with narrow streets lined with interesting shops, galleries, restaurants and pubs or you may like to take a boat trip along the river. We head home in the morning and have a stop for lunch on route before arriving back in the local area around 3.00/4.00pm. 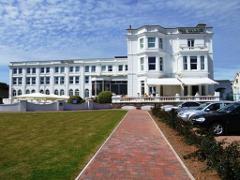 Situated on the level, only 200m between the seafront and town centre. 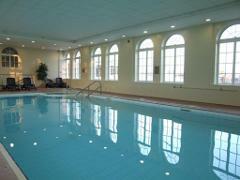 Leisure facilities at the hotel include an indoor swimming pool, games room, lounges a dance floor and a bar. Every night there is superb quality entertainment to enjoy and make the most of your holiday. The food in the restaurant has an excellent reputation serving a Full English breakfast and a 5 course evening meal. The comfortable ensuite bedrooms have Colour TV, telephone and tea/coffee making facilities. There is a passenger lift for your convenience.